Early minoan sign “labrys” of sumerian origin ? We see, minoan sign, excepting the handle, is close to sumerian ZAG-sign. =========================================== Minoan sign could had at the origin the sumerian proto-cuneiform signs, but as well could emerged independently, or rather BOTH HAD AT THE ORIGIN THE SHAPE OF THE ORION CONSTALATION , wich for both civilisations was related to archaic hunter/fighter so an icon of power ! (same at egyptians Usir(Osiris)/god-Sirius/star-Orion/constellation relation. Not “maybe” but sure, the story begins in time of the paleolithic hunter-gatherers, falowed by the shepperd-hero, but from the start maintaining a continous relation with the sky and stars so these personages being in same time astral deities. << This small plate, made of mammoth tusk and just 38 millimeters (1.5 inches) in length, 14 millimeters (0.55 inches) in width, and 4.5 millimeters (0.18 inches) in thickness, was found in the Geißenklösterle Cave in the Ach Valley of southern Germany (see fig. 1). Carved into its surface is a human figure, thought to be male, his arms raised above his head and his right leg extended as if about to walk. Dr Michael Rappenglück, an expert in ancient astronomies with the University of Munich, believes the tiny panel shows an abstract image of the Orion constellation (Whitehouse, 2003, and Pettitt, 2003). The figure’s slim waist and “sword,” which hangs between the figure’s slightly parted legs, one shorter than the other, appears to confirm this conclusion. Rappenglück proposes that the carved image is a depiction of Orion as the sky hunter. On the panel’s reverse are 84 mysterious notches, pecked out with a sharp instrument. These might easily signify the number of days in three complete lunar months, each of 28 days in length, linking the panel perhaps with the female menstrual cycle, and even human pregnancy. 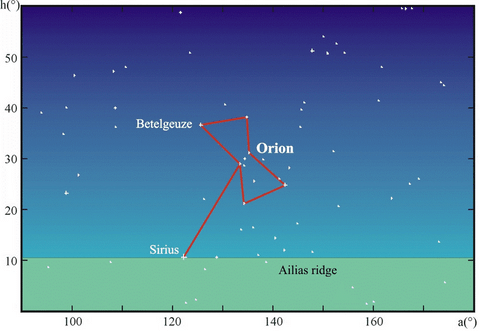 Yet Rappenglück goes further, suggesting that the 84 notches mark the total number of days the Orion star Betelgeuse (Alpha Orionis), remained visible in the sky around 32,000 years ago. If Rappenglück is correct, we have in this panel not only one of the oldest known representations of the human form, but also the first “star chart” in human history.>> Fig. 1. Small ivory plate found in the Geißenklösterle Cave in the Ach Valley of southern Germany, thought to show the figure of Orion in his role as the sky hunter. Earliest story concerning Orion was recorded by the Sumerians who ruled the southernmost region of Mesopotamia, or the land lying between the rivers Tigris and Euphrates. To this urban civilization, the constellation represented their hero Gilgamesh, whose exploits were immortalised in the first surviving piece of heroic literature called the Epic of Gilgamesh. While records point to Gilgamesh being a historical king who ruled over the Sumerian city of Uruk in southern Mesopotamia sometime between 2700 and 2500 BC, the mythology describes Gilgamesh as a demigod possessing superhuman strength whose great accomplishments assured his divine status amongst his subjects. The ancient Egyptians believed that the gods descended from the three stars of Orion’s Belt, and the bright star Sirius in Canis Major. Orion was originally regarded as the god Sah (Sahu), the “father of the gods”, with Orion’s Belt imagined as a crown upon his head, while the star Sirius was his wife Sopdet (Sothis), a fertility goddess whose earliest depictions were either as a reclining cow with a flower between its horns, or as a woman wearing a tall crown adorned with a five-pointed star. Sah and Sopdet were later syncretized with the deities Osiris and Isis, and while the appearance of Sirius (Isis) rising with the Sun (heliacal rising) around the time of the summer solstice following a 70 day absence heralded the flooding of the Nile and thus the start of the agricultural year, the appearance of the three “king-stars” of Osiris (Orion) at night after a similarly absent period, before pointing to Isis, signified the flooding’s end around the time of the winter solstice. The constellations associated with Osiris and Isis showed the deities standing on their separate celestial boats, both with human appearances, but with Osiris having green skin and a false plaited beard. Osiris was the deity in charge of death, the afterlife, and reincarnation, and the Kings Chamber in the Great Pyramid of Giza, completed around 2560 BC, was built with its southern air shaft pointing towards Orion’s Belt as a celestial marker for the pharaoh who would unite with Osiris in the afterlife and inherit eternal life. Incidentally, its northern shaft aligns with the circumpolar stars, where his soul would ascend to the celestial realm of the indestructible, undying stars that never set, a perfect destination for a king’s soul. << Thus, the author estimates that the labrys was mainly a Moon/Venus symbol, representing both the female elements of chthonic prehistoric cults of the Great Mother Goddess, and the destructive powers of cosmic and natural phenomena, later transformed into a dual archetype like the ankh, symbolizing the wholeness of the Cosmos and of human nature (Nikolaidou, 1994: symbol of dualities like male/female, nature/culture, Earth/Sky). On the other hand, the author agrees with the amazing hypothesis which has been made by Henriksson and Blomberg (2011, p. 65) naming Orion/Sirius as the Minoan constellation of the Double-Axe! This fact could explain the strong correlation of the Moon/Venus with Sirius. Orion is a prominent constellation located on the celestial equator and visible throughout the world. It is one of the most conspicuousand recognizable constellations in the night sky. It was named after Orion, a hunter in Greek mythology. Its brightest stars are the supergiants: blue-white Rigel (Beta Orionis) and red Betelgeuse (Alpha Orionis). 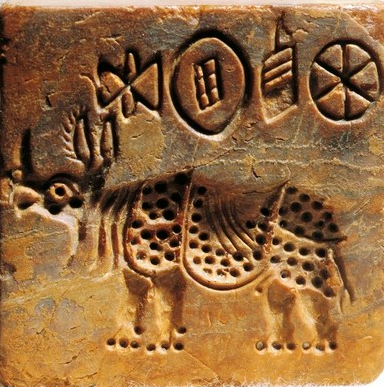 The earliest depiction linked to the constellation of Orion is a prehistoric (Aurignacian) mammoth ivory carving found in a cave in the Ach valley in West Germany in 1979. Archaeologists estimate that it was fashioned approximately 32,000 to 38,000 years ago. 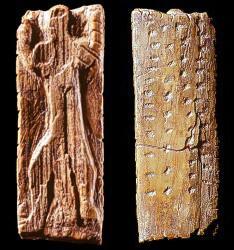 The Babylonian star catalogues of the Late Bronze Age name Orion MULSIPA.ZI.AN.NA,[note 1] “The Heavenly Shepherd” or “True Shepherd of Anu” – Anu being the chief god of the heavenly realms. In ancient Egypt, the stars of Orion were regarded as a god, called Sah. Because Orion rises before Sirius, the star whose heliacal rising was the basis for the Solar Egyptian calendar, Sah was closely linked with Sopdet, the goddess who personified Sirius. The god Sopdu is said to be the son of Sah and Sopdet. Sah is syncretized with Osiris, while Sopdet is syncretized with Osiris’ mythological wife, Isis. In the Pyramid Texts, from the 24th and 23rd centuries BC, Sah is one of many gods whose form the dead pharaoh is said to take in the afterlife. Orion’s current name derives from Greek mythology, in which Orion was a gigantic, supernaturally strong hunter of ancient times, born to Euryale, a Gorgon, and Poseidon (Neptune), god of the sea in the Graeco-Roman tradition. Impressions of two cylinder seals (Sumer) and glyph of ‘ingot’. The person at the feet of the eagle-winged person carries a (metal) dagger on his left-hand, clearly demonstrating the link with this metalware catalog. This entry was posted on April 17, 2019 at 7:26 am and is filed under Ancient civilisations, Astronomy, Epigraphy, PROTO-WRITING, Tartaria tablets, Vinca-Turdas culture. You can follow any responses to this entry through the RSS 2.0 feed. You can leave a response, or trackback from your own site.